Dylan Bryan shows off his gaming console he built. ELIDA — Dylan Bryan, a freshman at Elida schools, is making his mark as quite the electronics hacker. He’s scraped together parts and made an arcade-like gaming console. “We have the cabinet made out of 3/4 inch melamine. It was cut at a millworking shop on a CNC mill. I’ve got two joystick kits that are hooked up to a raspberry pi with USB encoders, then we have expandable USB ports on the front for any kind of controller you would like to hook up for a different input,” said Bryan. The brains of the gaming console is a readily-available mini-computer. “It’s run off a raspberry pi, which is basically about a credit sized computer that you can pick up for around $35 that runs Linux. It’s running an operating system called retropie that is dedicated to emulating almost any retro game you would like to put on it. It can go anywhere from old arcade games to, I believe, a PlayStation 1,” he said. Elida High School even supplied some of the parts for the gaming console. “It’s probably going to remain here because most of the parts were provided by the school. There was a bit of money cut out to get the materials like the buttons, the headers, the handles and everything. It was already an existing raspberry pi that was just being used for Maker Day. There were no guidelines on it it was just sitting there, no software to upload an image to it and it’s not exactly common knowledge of how to run these,” he said. His father, who works in Internet Technology, was a big help. “My dad would help, walk me through things and [I found information] mainly browsing the internet for different articles on how to do things,” he said. Bryan is also working on his Eagle Scout project and hope to incorporate his gaming console into helping kids in the Elida School system. “Possibly another one or two of these [consoles would be] provided to the Easy Program, the Elida After School Youth Program as an entertainment thing. I believe they just had a couple of Foosball tables in there,” he said. Bryan hopes to use his interest in electronics as a career. “I would like to go into probably network security or something along those lines,” said Bryan. In the meantime, he repairs cell phone screens to help pay for his hobby. 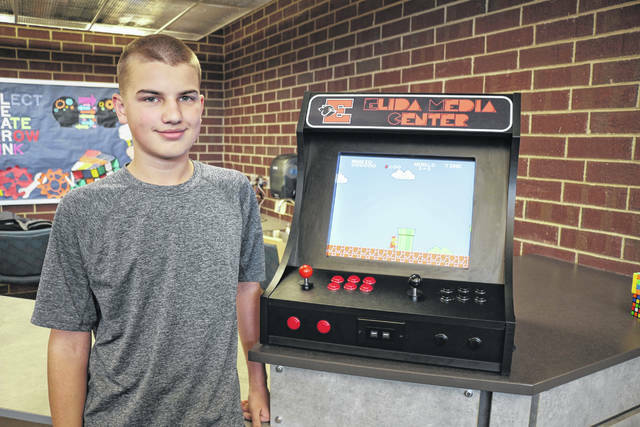 https://www.limaohio.com/wp-content/uploads/sites/54/2018/05/web1_youth-profile-Bryan-toned-1.jpgDylan Bryan shows off his gaming console he built.